I couldn't find this picture. But sometimes I can be a bit blind. 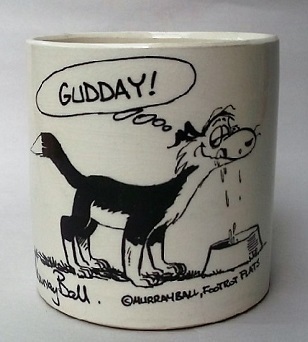 The mug is marked Made In New Zealand on the base. Thanks I will add it to the No Names Gallery. 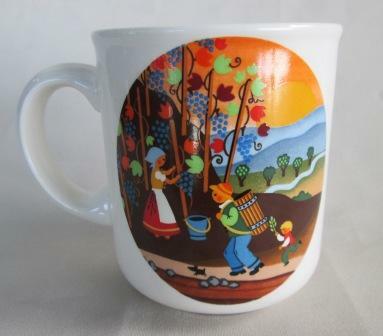 and Grape pickers on the other side..
Don't these designs look great. Are they all designed by Percy Golding? Or are some of the transfer patterns bought in? I am asking because some months ago I saw 4 mid size tiles with, I am pretty sure, the same season (winter, summer etc.) transfers at the Sallys in Foxton. They totally apealed to me but I was put off by the high prices in the shop and because the Sallys in Foxton are now, at least most of the time, more expensive than proper Antique shops. I voted with my feet and left the shop without purchasing anything and haven't been back since. I so loved visiting the shop before the price rises. This is just a guess, but I think American. they just look it..
Hello Kat, My mug has the Made In New Zealand embossed on the base. Or did you mean that the transfers are from America? You are right they do look american design. They are all under "S for Season:" the named gallery, so that they sit together. Great naming thinking Janice and yes it looks like you have the seasons correct. Hi Janice, I can't find the number for this pattern on the Portage Site. 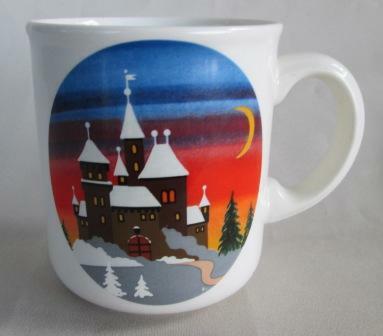 The Portage has two of these mugs and refer to them as Country Scene. I actually thought that you found the pattern name and number for these. Edits to add that I did find the records and I want to note that you have named them Season, which is a good idea as they were named only Winter, Spring, Summer and Autumn.